← Was Marc Gasol the right choice for Defensive Player of the Year? As a Lions fan – a team that generally picks early in the NFL draft – the draft tends to be the highlight of the NFL year. And since most readers of the WoW Journal are NBA fans, I thought I would offer a few thoughts on this event for those who primarily watch bouncing basketballs (and not flying pigskins). The NFL draft has seven rounds, and now takes place across three days. To help put this event in perspective – for an NBA fan – the following chart is an effort to convert each pick into its NBA equivalent. The basic idea behind this chart is that NFL teams have 22 starters while NBA teams have five. So therefore, the first 22 picks in the NFL draft are essentially the same as the first five picks in the NBA. And following this reasoning, the NFL is still making NBA-first-round picks into the 5th round. The NBA draft – as we have noted in this forum – is not entirely predictable. What we see in college doesn’t always translate into the NBA. However, performance in college is statistically related to what we see in the professional ranks. So when teams draft players who did not perform well in college (such as Austin Rivers), we should ask questions. Can we do the same for the NFL? Although there are many mock drafts and plenty of people providing draft grades immediately after this event concludes, evaluating college talent in football is amazingly difficult. And this difficulty can be seen by just considering how hard it is to forecast the performance of veterans who are already in the NFL. And here is what we see when we look at the components of the NFL’s quarterback rating. Turnovers are a big part of football. And as one can see, these are very hard to predict (a similar story can be told for fumbles). Now contrast these results with what we see in baseball and basketball. 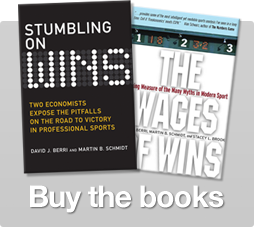 In Stumbling on Wins, Martin Schmidt and I noted that you see much more consistency in the other major sports. For example, in hockey 80% of a skater’s shot on goal (per-minute) this season are explained by a skater’s shots on goal the previous season (but for goalies, only 6% of a goalies current save percentage is explained by last year’s save percentage). And in baseball (this results was originally reported by JC Bradbury), 43% of a hitter’s OPS this season is explained by the same player’s OPS last year (pitchers, though, are not quite as consistent with respect to popular metrics like ERA). And when we turn to basketball, we see that for many measures, about 80% of what player does this season is explained by what he did last year. In sum, with the exception of goalies and pitchers, veteran performance in the other major sports is somewhat consistent. In the NFL, though, veteran quarterbacks are hard to predict (and in Stumbling on Wins, similar inconsistencies were reported for running backs). Now turn to the draft. In the NFL draft, decision-makers are not just forecasting what a player who has already been in the league will do next year. They are trying to forecast what a player who has never faced NFL competition will do in the future. Such a forecast requires a decision-maker to not only assess the individual player’s abilities, but also how those abilities will interact with the other players on the roster in the future. For many positions, we don’t have great measures of individual performance. And because the interaction effects are likely large, it is hard to interpret what these measures for the individual really mean. Further complicating these forecasts are the high rate of injury we see in football. And that means that even if you nailed the forecast of ability and fully understood all the interaction effects, player injury can transform a great pick into the perception of a bust. So much of what we hear this week will not be consistent with what we observe in the NFL in the future. Of course, that is not going to stop fans – especially fans of the Lions (who really live for the draft) – from being excited. In other words, I just know that the Lions picks are going to be great. And with the help of the players the Lions are drafting, 2013 is really going to be a great year for the Lions. Hey, if we can’t predict well, why not just predict the best? I have been doing this for decades, and look how that has worked out for this Lions fan! 5 Responses to "A few thoughts on the NFL Draft"
To be honest, I used to be a bigger football fan, but your compelling argument about the randomness of outcomes moved me more towards bball. Maybe the brain stuff too… God I wasted so much time obsessing over each pick. Speaking of the nfl draft, do you have interest/thoughts in/on the “Sports Science” analysis broadcast on ESPN 2? From what I saw, the program was an attempt to break down potential nfl players’ abilities into quantifiable measures and then track these stats against those of previous draftees who have (or have not) succeeded in the nfl. http://espn.go.com/espn/sportscience/index. Have you already written about this program? Is is stupid? Is it worth watching? One of the lessons of games like backgammon is that in an environment with limited information, making bad decisions will sometimes pay off, and making good ones will sometimes hurt you. Of course, in the rarified air of the NFL, the unknowns aren’t nearly so familiar as a pair of dice. It’s not the NFL, but the Wages of Wins staff still believes that the Piston’s drafting Drummond was a poor choice, even if it has paid off for them. > therefore, the first 22 picks in the NFL draft are essentially the same as the first five picks in the NBA. > And following this reasoning, the NFL is still making NBA-first-round picks into the 5th round. Of course when I start looking into the question further, I get that (according to http://www.82games.com/barzilai1.htm) the NBA player value drops by a factor of e^(-0.055) per pick, and AFAICT according to Massey-Thaler, in the NFL it’s about e^(-0.011) per pick. So the relative value per pick ratio is 5:1, which is pretty close to what’s suggested. Even so, it’s worth pointing out that a team getting the first pick in the NBA, is equivalent to a team getting picks 1-4 or 1-5 in the NFL. Being the first pick in the NBA is relatively much more significant. This is something I have wondered about the NFL draft: would it make more sense to statistically evaluate the scouting staff? Some organizations, seem to always draft well at certain positions, like the Cards and wide receivers. I don’t know if that’s just the popular narrative or if there really are teams that have a lock on certain positions. But if it was true, it seems like you could assemble an all-star scouting staff (no constraints on spending there) as a means to increase the talent level of a football team. The other thing I wonder about the NFL draft is: does the lack of predictability lead the preponderance of weight that is given to combine measurements. “I don’t have a way to predict how good of a NFL CB he’ll be, but he is in the 90th percentile for NFL CB’s in 40 times, and that’s a good place to start”. I have seen commercials for that show, but never watched. The 82game.com study is not a very good study.